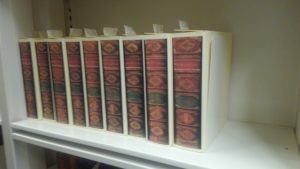 MBLC Blog – Page 2 – News, updates, and musings from the Massachusetts library community. Library trustees have a unique and vital role in the oversight, stewardship and advocacy of public libraries in Massachusetts. Trustees gain their authority from legislative statute (MGL Chapter 78, Section 11) but the details of their day-to-day duties are based on local rules, bylaws and traditions. Because of this, the MBLC does not have legislatively mandated regulations for how trustees must carry out their duties. 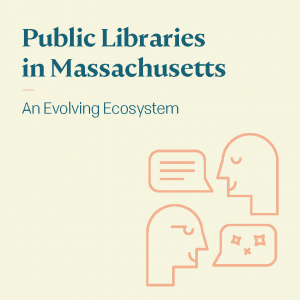 What we do have is the benefit of over 125 years of experience as a statewide agency overseeing libraries in Massachusetts. This experience has established a wealth of best practices that is available in the newly revised MBLC Trustee Handbook. The handbook is a valuable resource to help trustees navigate the many procedural and policy questions that boards face on a daily basis. 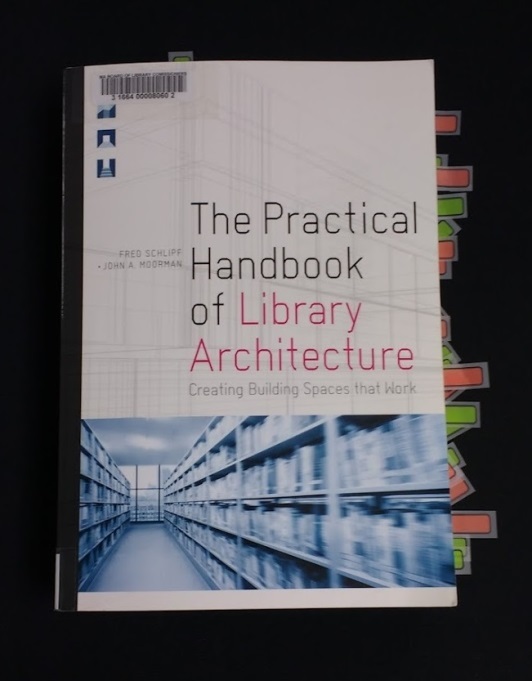 The handbook is arranged by the following sections: Becoming a Trustee, Board Organization, Legal Responsibilities, Policy Making, Planning, Personnel, Budgeting and Financial Management, Library support: Fundraising, Foundations and Friends, Advocacy; Library Construction and Resources. 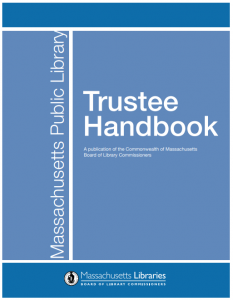 The handbook is available in PDF format on the MBLC’s Trustee Page (https://mblc.state.ma.us/for/trustees.php). 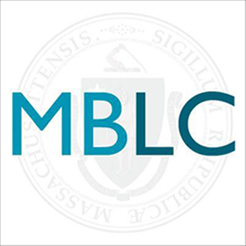 In addition to the handbook, the Trustee Page links to the MBLC Trustee Resource guide , MBLC resources and services, and to the Massachusetts Public Library Trustees Discussion List. If you have any questions or feedback regarding the Trustee Handbook please let us know! Contact Rob Favini, Head of Library Advisory and Development (Robert.favini@state.ma.us) or Maura Deedy, Library Advisory Specialist (maura.deedy@state.ma.us). If you happened to visit the Shrewsbury Public Library on Saturday October 20, you may have noticed the meeting room filled with people exchanging ideas and conversation. On this particular day, it was the annual meeting of the Massachusetts Friends of Libraries (MFOL) association. This group works to advance libraries and provide support to Friends groups across the commonwealth. One of the highlights of the annual program is the presentation of the 2018 Donna Forand Fantastic Friends Award. This award is for a creative event or activity above and beyond traditional Friends activities like book sales. 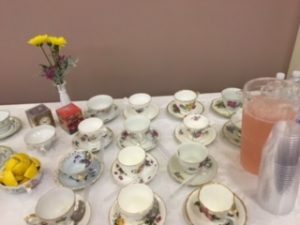 The recipient of the 2018 Donna Forand award was the Friends of Millis Library who hosted a Royal Wedding viewing party friend and fundraiser, complete with a lavish sit-down wedding breakfast tea with china and cloth napkins. Attendees were encouraged to dress up with their best hats and fascinators and have a moment on the red carpet with a cutout of Queen Elizabeth. A local bakery donated a wedding cake with the same flavor profile as the royal wedding cake. Millis Friends’ President Sandra Elaine Scott and Millis Friends’ Treasurer Meghan Gavaghan were on hand to accept the award. 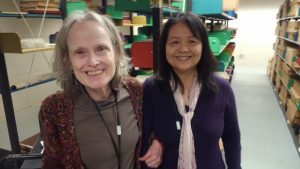 In addition to raising money for the library, this high profile event generated buzz and local media coverage was able to raise awareness of what the Friends of Millis Library do. Sandra and Meghan shared that there were many attendees who were new to the library, and learned about all the programs and activities the library offers. It ended up being a friendraiser in addition to a fundraiser. The Friends of the Erving Public Library received runner- up recognition for their project to establish a Little Free Library to be placed in a new park called Riverfront Park of Erving. The Friends purchased a Little Library kit, assembled it, and negotiated with the Town to have it placed in the new park on the eastern side of town. Any person who uses the park can take a book, or leave a book. This Little Library is part of a national project and movement with over 75,000 locations. Rebecca Hubbard, the president of the local Friends group accepted the award and Barbara Friedman, Library Director, accepted a cash contribution for use for Library activities. Rebecca shared some of their lessons learned from the process, like start early if you are interested in having it be in a local park and be aware of any local zoning requirements. They were able to get buy in and generate excitement in the town, who was supportive of the project and paid for the installation. The Friends also ensure the library is stocked with books. These are just two of the exceptional activities that are organized and executed by Friends of the Libraries. Congratulations to Millis and Erving for their truly fantastic Friends! Imagine going to a Boston Bruins game and getting to take a ride on the Zamboni or hi-five Zdeno Chara. 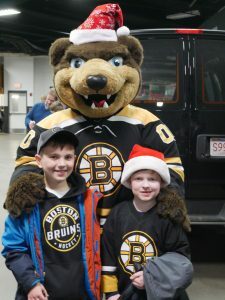 At their game against the Anaheim Ducks on December 20, 2018, that’s just what happened when the Boston Bruins celebrated the three grand prize winners of summer reading! The winners were all chosen through a random drawing after completing their local libraries summer reading programs. The winners this year were chosen from a pool of over 300,000 children and teens that participated in the annual summer program. The prize recipient from Topsfield got to ride the Zamboni before the first period began. 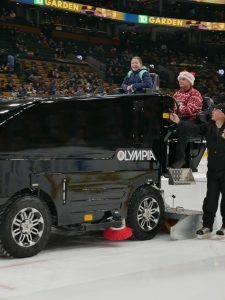 She got to be down on the ice riding the world famous ice truck while taking in the sights and sounds of the TD Garden. She made a point to wave to all of the Bruins fans up in the stands. 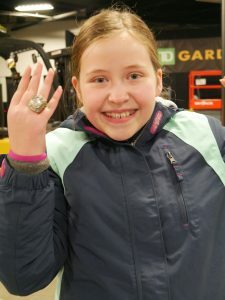 After the ride, she also had the opportunity to try on the Bruins 2011 Stanley Cup championship ring. 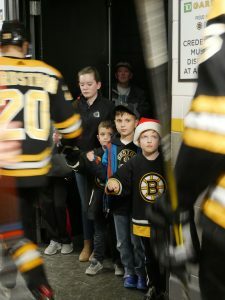 After the first period, the two other prize recipients from Westwood and Erving went down to the tunnel between the ice and the Bruins locker room and lined up to get fist bumps from the players. Stars including summer reading champions Brad Marchand, Charlie McAvoy, and Ryan Donato walked by and high fived the two boys who were ecstatic to meet their heroes up close. To top the night off, the 3 summer reading prize winners got to enjoy watching the Bruins defeat the Ducks 3-1. The Bruins have been awarding prizes to readers since 2009, and summer reading participants from across the Commonwealth look forward to their chance to win at the end of every summer! In addition to the in game experiences, participants from around the state are also rewarded with team-signed Bruins jerseys and Bruins pucks signed by Bruins defenseman Charlie McAvoy. In all, 27 children and teens from the following libraries received prizes. You can find out more about the prizes and the summer reading program here. The MBLC Welcomes Andrea Bunker! Andrea Bunker started at the MBLC on December 6 as our new Library Building Specialist. 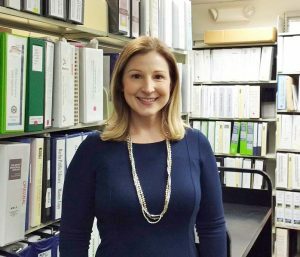 She will be working closely with Lauren Stara to administer the very successful Massachusetts Public Library Construction Program. Andrea comes to us from Woburn Public Library, where she was Director since 2016. She’s been spending most of her time on the WPL’s addition and renovation, which is slated to reopen in February. Her experience will be especially helpful to libraries planning renovations to historic buildings – the Woburn Public Library is a National Historic Landmark and was the first library designed by HH Richardson, who became well known for public libraries. 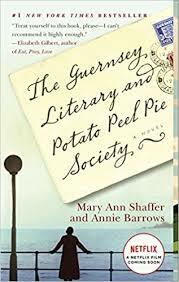 Prior to Woburn, she participated in a space planning project for the Newburyport Public Library where she served first as the Teen Librarian and then as Senior Librarian for Reference. She holds an MLIS from the University of Rhode Island and a BA in English and Secondary Education from Northeastern University. Please join us in welcoming Andrea to this crucial role! Posted on December 3, 2018 April 5, 2019 Author Matt PerryCategories Construction, MBLC3 Comments on The MBLC Welcomes Andrea Bunker! 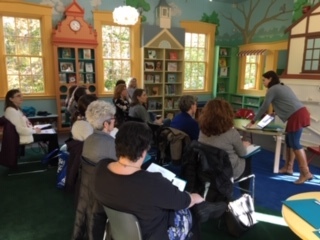 On October 29, 2018 staff from seven libraries that received FY19 LSTA grants for Mind in the Making: Supporting Play Spaces in Libraries convened for training in the beautiful repurposed Fells Branch of the Wellesley Public Library. In addition to Wellesley, the communities of Bedford, Bourne, Rutland, Shirley, Waltham and Shrewsbury will spend this year expanding opportunities for young children to participate in creative play activities in the library as well as to build, problem solve, think critically and even embrace failure as they become more confident and engaged learners. Under leadership of library director Jamie Jurgensen who applied for a LSTA grant, the library interior features wood replicas of Wellesley’s famous buildings as well as frescos of local flora and fauna that are both a delight to see and touch. 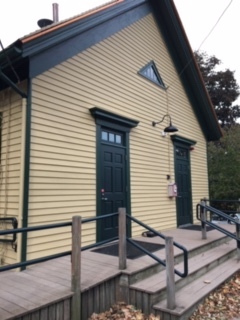 The Fells Branch, first opened in 1858 as a one-room schoolhouse, became a branch library in 1923 but recently has been used as a nursery school. 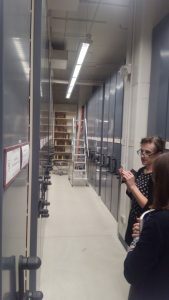 Now, thanks to the generosity of the Wellesley Free Library Foundation and the Wellesley Foundation, the newly painted and refurbished branch opened to the public on November 17. 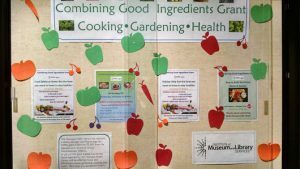 The LSTA training featured Alli Leake, Director of Education from the Discovery Museum in Acton who maintains a “Play Matters Blog” on the museum website. 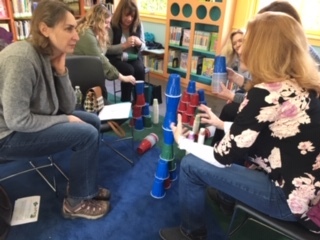 She invited librarians to engage in a play activity by cooperatively building structures with “found materials” which in this case were paper cups. Additional support was provided by Jessie Kravette of the Boston Children’s Museum who shared some of the many BCM resources that support the importance of play. Participating librarians were excited to share some of the many ideas they will be implementing over the course of the coming year as they create interactive play and flexible learning spaces in their own libraries.